The next generation FreeRadical from Xtracycle features a patent-pending, rugged, torsionally-rigid and elegant frame. A bomb-proof mounting system means an entirely new level of rigidity and integration of your chosen bike frame and the Xtracycle leap cargo-extenions. Fully compatible with the wide range of Xtracycle cargo and family accessories. Optimized for electric conversion with any number of aftermarket electric systems. The Swoop a deep step-through EdgeRunner that is every bit as stable as the conventional EdgeRunner. In front, a 15mm thru-axle fork brings a whole new level of performance to the longtail design by increasing torsional rigidity and giving you better control over your bike. A Shimano Acera shadow drivetrain allows smooth shifting through 27 gears, and Shimano hydraulic brakes provide superior stopping power. Reflective Schwalbe Big Ben tires give you excellent flat protection and extra visibility, and keep you on the road for miles and miles. With the EdgeRunner Swoop, you get a safe, sturdy ride that’s easy to get on and off - no matter what you’re wearing or carrying. 100% chromoly steel frame and fork. The next level of Edgerunner. With sophisticated geometry in a shock-absorbing and lightweight chromoly steel frame, this bike is designed to fit almost any rider. The thoughtful design gives the rider a low step over height, so it’s easy to mount and dismount even with kids or groceries on the back. With a 15mm Thru-Axle fork, a Shimano XT front hub, powerful Shimano hydraulic disc brakes, and reflective Schwalbe Big Ben tires, the Edgerunner Classic offers an extra level of stability to give you that feeling of certainty. No matter the load, no matter the road. This comes with mounts for the versatile, strong, and useful PorterRack, which pairsexceptionally well with the PorterPack. The 10E also comes stock with useful Xtracycle accessories like the EdgeRunner WheelSkirts, which protect passengers and cargo from touching the rear wheel. The heavy duty double-legged kickstand, the KickBack, comes standard as well. This comes with mounts for the versatile, strong, and useful PorterRack, a front tray that attaches into the frame and offers front cargo capacity without sacrificing stability. 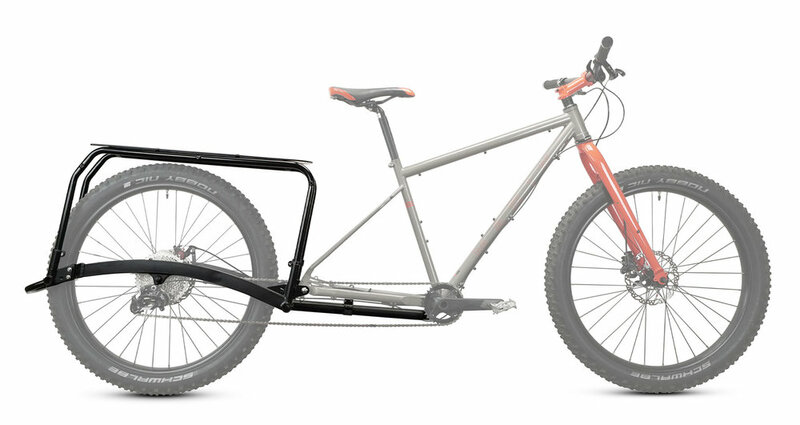 Add the custom Xtracycle PorterPack and you've increased your front rack carrying capacity by ~29 liters. The integrated E3 V6S headlight and E3 rear Supernova lights will ensure you're never caught out on a late night ride without lights again (sold separately).